I have shorted the USDX, September contract. Entry occurred this morning at 8:44 at 83.95. I was unable to post the trade into my blog at the time as I was just heading out the door. I am now writing at the end of the day from my hotel room. I had been waiting for the US Dollar index to approach the 84.00 level, and it overnight between Sunday and Monday. The daily chart has given me a sell signal, and I waited for the MACD divergence that occurred on the 60 minute chart to turn prices around before entering my short position. 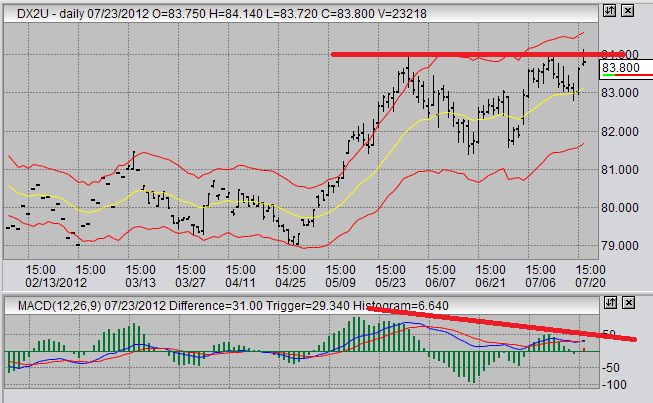 Take a look at this daily chart for the USDX September futures contract. We can see prices have made their third top into the 84.00 range. Notice that the corresponding peaks on the MACD histogram decline with each occurrence. The MACD moving averages are also showing lower consecutive highs each time prices hit 84.00. This tells me to short the Dollar at 84.00. 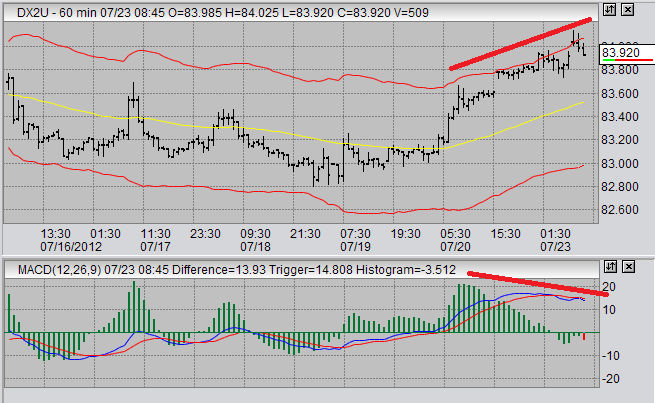 Now look at the 60 minute chart for the September contract for USDX futures. Here we see prices steadily making new highs overnight into and past the 84.00 level. Simultaneously, MACD histogram and moving averages fail to keep up with the new highs. This told me that a reversal in that time frame could be coming up. This reversal on the 60 minute time frame, combined with the data from the daily chart told me "SELL! ", so I did. In addition, I am also watching weekly charts with COT data. I won't go into why at this time, but that data is also giving me a sell signal right around now. Hopefully the downward momentum picks up over the week to bring prices into the 82-81 range, or lower. In other markets, I've been stopped out of my 10 year treasury position at a loss. What a shame, I was hoping that trade would work out. In truth, I'm not all that comfortable trading that market. I still need a lot of time to familiarize myself more with treasuries. It's one of my longer term goals, as that market is so heavily traded it provides opportunity for some heavy positions. I'm wary about sugar, I haven't decided whether its up or down. I feel like leaning towards more upwards dynamic in the longer term (1-2 months), but maybe a correction in the near term (1-2 weeks).